We recently completed a two and a half week trip to Australia during which we created many memories that will last a lifetime. We chose to prioritize the land down under over other destinations primarily because the last few years have seen a near constant stream of stories about bleaching on the Great Barrier Reef from chemical dumps and temperature changes. While there has been some recovery, we wanted to see this natural wonder before it ceased to exist in a recognizable state. Other than that, we really wanted to experience Australian culture (including their famed coffee scene) and see a few specific sights on the continent. During our time in Australia we chose to prioritize the cities on the eastern part of the continent given how vast the country is. In the future, we may return to visit the Australian interior and Western Australia, but we didn’t want to rush through our trip by trying to do everything. In case you’re not aware, Australia is really far from the United States. Cash fares to the continent have recently been fantastic, but I knew that flying in an economy seat for 16 hours and arriving at 6AM would leave Angela and I absolutely crushed and unable to enjoy the start of our trip. Business class tickets on the limited direct flights to Australia from the United States (there are only 18 routes in total spread across NZ, AA, DL, QF, UA, and VA) are above my pain point and rarely go on sale due to demand and the low overall passenger count per day. As such, I started evaluating how to best use my stash of airline miles to get us there and back. I quickly found that UA almost never releases low level award availability on their Australia routes and discarded that as a realistic option. The same goes for NZs fifth-freedom routes. DL and VA require an absurd commitment in terms of miles so that left me with AA and QF as the only realistic options. Luckily, both airlines are part of the oneworld alliance so I could use my stash of AAdvantage Miles to book either airline for any routes that became available. I knew we wanted to go in the Australian fall as temperatures started to drop and crowds thinned out. Given that, I set up a plethora of award availability alerts on ExpertFlyer and waited for something to match up that would give us two and a half weeks in country. My patience paid off and I was eventually able to snag two separate itineraries within a few days of each other. Our outbound itinerary was LAS-DFW-SYD with the first leg in AA Y leaving at 1:00AM from LAS and the second leg in QF F on an A388 leaving at 8:55PM from DFW. I didn’t really want to leave at 1:00AM, but that was all that was available at the time of booking. A few months later, award space opened up at a more reasonable time and I was able to change our flight from LAS leave to later in the day. AA’s policy, when booking with their miles, is that you can change your flights to any that have availability as long as your origin and destination remain the same. As such, you can book something non-ideal and hope something better opens up in the future. The total cost of this booking was 220,000 AAdvantage Miles + $68.80. For the return to the United States I booked MEL-SFO in QF J on one of QF’s new 789 aircraft. Unfortunately, there was no availability from SFO to LAS at the time of booking. I wanted to secure the long-haul so I bought a ticket in AS Y using a $0 companion fare from SFO to LAS to complete our journey. I eventually ended up canceling the Alaska ticket and booking a WN flight home the night of our return for 21,019 Rapid Rewards points and $11.20 (due to our Companion Pass). The long-haul booking cost 160,000 AAdvantage Miles + $159.02. We would be flying extensively inside of Australia as we moved between cities. Another oneworld alliance partner, BA, has a distance based award chart so I used their program to book short flights on QF. AS is a non-alliance partner of QF and I used their fixed region award chart to book the longest flight inside of Australia. This was perfect because Angela had some lingering AS miles that we’d been struggling to find a use for. I found award availability was plentiful on all of these intra-Australia routes. Why fly business class on these one to three hour flights? First, I had enough miles stashed away that it was not a burden to do so. Second, we would have access to the QF lounges within Australia to relax and work while at the airport if necessary. We could have saved a considerable number of points by flying economy but circumstances were such that we didn’t have to limit ourselves. We are generally loyal to Marriott given their large footprint and the value we get out of the status benefits we’ve accrued, but the Park Hyatt Sydney is one of those properties that everyone raves about and is bookable using World of Hyatt points. We used 90,000 points for three nights and I emailed the manager to secure a cash upgrade to a room with a view of the Sydney Opera House. The rest of the properties were booked using cheap-ish cash rates that I monitored and rebooked if they decreased. I also, generally, booked through some type of cashback or award portal to get a little bit extra out of the rates we were paying. On March 11th, we dropped Fitz off, double checked that we had packed everything, and waited anxiously for our driver to come get us for our flight. That’s when we started getting flight delay notifications about our LAS-DFW leg. The flight was continuously pushed back from a departure time of 12:54PM and we finally left the gate at 3:33PM. This left us a little over fifty minutes to get from gate to gate once we arrived in DFW. Having never connected through that airport before, we didn’t know what to expect but all of the AA agents we spoke to said we’d be totally fine. In addition to the reassurances, they moved us into the row right behind first class so we could deplane quickly. Luckily, we caught a tailwind on the way to DFW and landed considerably earlier than expected! We were even told we would be parking at Gate D18, three gates away from our flight to Sydney. That did not end up happening. We sat on the tarmac waiting for twenty minutes before the pilot was directed to taxi to Gate A8. By the time we got off the plane, our flight to SYD was already boarding. We walked briskly (and if you know our regular walking speed, I’m sure you can understand what walking briskly means) to the Skylink tram that whisked us between terminals, got in line, and boarded our flight about twenty minutes before doors closed. We generally do not cut things that close, so this was a bit of a stressful experience for us. That stress quickly melted away once we settled into our seats on QF’s A388. Each seat in F is more like a self-contained suite. We stowed our bags, enjoyed some pre-departure beverages and canapes, and settled in for the long haul. I didn’t really know what to expect because we’d never flown on an A380 before. Takeoff was long and smooth as the huge aircraft set off into the sky. As soon as we hit 10,000 feet the flight attendants asked us what we wanted for dinner and I moved to join Angela in her suite so we could eat together. Dining together on a flight was pretty neat and something that I’ll be looking for with the other experiences we’re having this year. For dinner, I started with the steak sandwich and Angela opted for the Moroccan carrot soup. We both chose the beef filet as our main course. The service was top-notch throughout our meal and the food was uniformly good, although the steak was a little more done than I would have liked. For dessert, Angela had fresh fruit while I indulged in a cherry streusel tart with coffee. The tart was nicely composed with the cherry coming to the forefront and a thick vanilla cream accenting the pastry. During dinner, the flight attendant made up my bed with a thick mattress pad and copious pillows and bedding. After our meal, I changed into the extremely comfortable pajamas we were provided, laid down, and fell asleep with few interruptions for the next nine hours. This was, without a doubt, the best sleep I’ve ever gotten on an airplane. The combination of the suite’s privacy, the bedding’s comfort, and the ideal flight time (an evening departure) turned out exactly like I had hoped. When the flight attendant saw that I was awake he asked if I wanted anything and quickly delivered the water and coffee I requested. He also stowed my bedding on request as I went into the forward area to do some stretching and headed upstairs to check out the lounge area. Before long, we were asked if we’d like to enjoy breakfast before landing. The answer was a resounding yes! For this meal, Angela joined me in my suite so we could have the experience from the other seat. Angela ordered scrambled eggs and bacon whereas I opted for the poached eggs and bacon. Each dish was served on a lightly toasted piece of bread. Our eggs were perfectly cooked, a rarity on airplanes, and I gobbled mine up so fast that the flight attendant jokingly asked if I wanted more. I responded in the affirmative and she set off to find me some more eggs to poach. After five more cups of coffee, Angela and I settled in for landing. The entire flight experience was incredible. The food was delicious, although not the best I’ve ever had on a plane. The service was attentive but not overbearing. The seats were huge and the bedding was extremely comfortable. It was worth the miles I used for it and is something I would do again in an instant given the opportunity (and a need to get to the South Pacific). Immigration and customs at SYD were a breeze. There are automated gates for those with e-Passport enabled passports, like ours are, and the customs check with nothing to declare is cursory after collecting your checked bags. After exiting the international arrivals area we saw ample signage to the train station. We purchased an Opal card before the entrance gates with enough credit to get us into the city from the airport, back to the airport at the end of our trip, and a few bus rides within the city. The train ride from the airport to Circular Quay was quick and we had less than a mile to walk to our hotel, the Park Hyatt Sydney. We landed early in the morning so we requested to drop our bags and get our room keys later in the day when our room was ready. We stopped for a quick selfie with the Sydney Opera House (the first of many) and started our day full of adventuring. It started to lightly rain, so we popped out our umbrellas and headed to The Royal Botanic Garden Sydney. There was a tremendous array of flora on display. We saw towering trees and delicate flowers. We encountered our first Australian flowers and marveled at the local indigenous birds. One of the first things we noticed was that the Australian replacement for the pigeon, the Ibis was much more interesting to look at than our alternative. We strolled through the garden for quite a bit of time and ended up at Mrs Macquarie’s Chair before turning around. We then made our way to Hyde Park passing St. Mary’s Cathedral on the way. I found the cathedral to be surprisingly impressive in terms of size and architecture. The single most impressive part of Hyde Park is the Anzac Memorial located at the southern end. The memorial was a somber remembrance of the soldiers who fought in The Great War. It is specifically designed to highlight the tragedy of war and memorialize individuals rather than glorify the acts of warfare and the conflict about which it speaks. Another interesting structure in the park is the Hyde Park Obelisk. At first glance it looks just like any other city’s random memorial obelisk. It is only upon further examination that you discover it was originally designed as a sewer vent and, in days past, spewed gases from the sewer into the air in the middle of the city. Angela had read about a coffee shop, Black Star Pastry, that had watermelon cake and is considered a must-visit in Sydney. We wandered through a random mall for a few minutes and eventually found the place. Our first flat whites in Sydney were delicious and the cakes were delightful. The watermelon cake was both light and fresh and Angela really enjoyed it. We walked to our first timed activity of the trip, a tour of the Sydney Opera House. The structure is absolutely incredible both from a distance and upon closer inspection. The tour commenced, after a few technical difficulties with our headsets, around 11:30AM and took us into both large theaters and one of the four smaller theaters. The venues were impressive with the rich wooden surroundings in the Concert Hall being my personal favorite. We were given some information about the genesis of the plan and the actual construction of the building, but it was a tad light on details. The group size was fairly large as well. I’m glad we took the tour because it is the only meaningful way to get access to the places we wanted to see without actually paying to see a show, but I think there is some definite room for improvement. After our tour completed we were off to our second planned activity of the day, BridgeClimb Sydney. After checking in, we grabbed some Australian snacks to give us energy for our climb. We chose kangaroo and crocodile jerky along with a bit of coffee. The jerky was good enough to give us a bit of energy but it wasn’t something I’d eat again if other food is available. We were called into a room at our scheduled time and filled out a waiver before being fitted for our jumpsuits and geared up for the next few hours. The process was extremely well-orchestrated and included an introduction to our climb leader, a simple orientation for the climbing process, and several reminders about safety. Most interestingly, everyone was required to submit to a breathalyzer before the climb for, I’m assuming, liability reasons. Before long we were off to the top. Conditions were windy and cool with light rain falling sporadically throughout the climb. Even with the adverse weather conditions we had an absolute blast. It is definitely a tourist activity, but it is one that I would recommend to anyone looking for an interesting perspective on the city, both visually and historically. It was a delicious mouthful – who knew that pineapple on a burger would feel so right? After dinner we headed down the street to our hotel and grabbed our room keys. As soon as we walked in, I knew I’d made the right decision to arrange an upgrade to a room with a view as the Sydney Opera House was omnipresent from everywhere in our temporary home. It was an incredible sight the first time and every time thereafter. Our very busy first day ended with us admiring this view. We awoke early from excitement on our second day in Sydney and decided to keep things easy and eat breakfast at the hotel. The spread was scrumptious and the egg dishes offered were quite delicious. It wasn’t a great value because of the cost, but it certainly made the start of our day smoother. After breakfast, we put on our water shoes and headed to the Sea Life Sydney Aquarium for our first ever diving experience. Because we arrived early, we were able to tour about half of the aquarium before meeting our dive instructor and preparing to meet some aquatic animals up close. Our instructor was Harry and he did a great job introducing us to the diving concepts we’d use during our experience. We went over breathing through the regulator, using hand signals, what to do in case of discomfort, and everything else we might need to know. After an in-office orientation we were geared up in a wet suit, dive boots, gloves, cowl, buoyancy control device, and pressurized air cylinder. We first entered the water in a training tank where we rehearsed everything we’d be doing underwater. We practiced breathing through the regulator, clearing water out of it if it came loose from our mouths, clearing water from our masks, equalizing the pressure in our ears, and moving around. After the instructors were comfortable with our preparation, we headed into the main tank. The experience was exhilarating. There were moments where we were just inches from the sharks, fish, and rays in the tank with us. They swam above, behind, and directly at us at times and it was just wondrous to be there with them and know that we were strangers in their land. The dive was complete in what felt like no time at all. We exited the tank, stripped ourselves of our diving gear, and showered the briny water off of us before viewing the pictures and videos from the dive. We had a fantastic experience from beginning to end and even made an awesome new friend in our dive buddy. We wholeheartedly recommend Shark Dive Xtreme if you’re looking for a once-in-a-lifetime experience. We resumed our tour of the aquarium after our experience was complete. The aquarium had a decent number of exhibits, but is not somewhere that we would specifically recommend if you weren’t going to be doing the dive experience alongside it and have previously visited a top tier aquarium. The signage was a little lackluster and that made it hard to identify a lot of the species on display. We still had quite a bit of fun, though. We were greeted with bright sunshine after leaving the aquarium, a complete turnabout from the 100% chance of rain that had been predicted, and decided to take advantage of the great weather and head to the beach! We took the bus from Circular Quay to Coogee to start our trek along the coast. We walked alongside the ocean for several miles from Coogee Beach to Bondi Beach and the vistas were absolutely incredible. There were several beaches along the path and a ton of sheer rock cliff faces that made for very dramatic viewing. We even walked alongside an enormous collection of grave sites called Waverley Cemetery. We were peckish, as they say, after our long walk and decided on a pizza place near Bondi Beach named Da Orazio Pizza + Porchetta. The service was great and the pizza was good. The dough was extremely tasty, although less crisp than I would normally expect, and the toppings were fresh and flavorful. I enjoyed the chili oil we were given and would definitely use it on pizza in the future. If you’re looking for somewhere to eat after your beach walk, I would recommend this place. After dinner, we took the bus back to Circular Quay, grabbed some gelato in the rain on the way back to our hotel, and ended the day with a few bites of deliciousness. We’d been so busy during our first few days in Sydney that we didn’t have much left on our list. The only thing remaining was the Art Gallery of New South Wales so we decided to take in a leisurely breakfast before strolling over at the opening hour. For breakfast we chose The Fine Food Store and I am very glad we did. We both ordered the brioche breakfast roll with poached egg and split the blueberry bircher muesli to provide a little lightness. Everything was delicious. We strolled through the previously visited garden on the way to the gallery and stopped to enjoy the carnivorous plant display that wasn’t open on our aforementioned visit. We enjoyed a few exhibits at the gallery before making our way out into Sydney proper. To be quite frank, there just wasn’t a lot to hold our interest. That being said, there were three things that we did like. The first was a mixed media exhibition comprising drawing, painting, and film from William Kentridge. The artist managed to bring a bunch of disparate techniques together into an interesting whole, completely outside my expectations. The second interesting section was landscapes of central Australia and parts of New Zealand. The terrains depicted by various artists were otherworldly, in a single word. They looked like alien worlds you’d see in a science fiction film rather than something that should exist here on our home world. Finally, I really enjoyed the work of young artists that were on exhibition. It was obvious that the student eyes had yet to be jaded by the world around them and this led to some interesting pieces with commentary on the world around us or interesting visual effects. Apparently the art gallery has exhibited students’ final projects since 1983, something I find quite astonishing. We grabbed a final selfie in front of the Sydney Opera House because the weather was beautiful. After the museum we headed to the hotel to rest up after two and a half non-stop days following a 16 hour plane ride. For dinner, we decided to try something unique and chose Tayim, a contemporary Middle Eastern spot. We tried the Wagyu cigars, Tayim plate for two, kangaroo kebabs, lamb shoulder, and a tomato and cucumber salad. Each piece of the meal was tasty, although the lamb shoulder was a little less spiced than we expected. I left the meal feeling extremely satisfied. After an exhilarating start to our Australia adventure, we took a break day to allow us to catch our breath, get some work done, and move to our next destination. In the morning, we took a quick trip to Playfair Cafe to get a bite. The restaurant is more like a deli counter with some tables set up on the street than a traditional cafe. The food was simple and good, but we both left wishing we’d gone back to the Fine Food Store again. After a few more hours of work, we checked out of the Park Hyatt and bid farewell to our view of the Sydney Opera House. We took the train back to the airport and alighted at SYD’s domestic terminal. QF only allows 7 kilograms per bag for carry on luggage so we were forced to check our roller bags. Luckily, the process was quite quick and we were through security without much delay. We had access to the Qantas Business Lounge in Terminal 3 and hung out in there for several hours as we waited for our flight. It was a great place to work and the food was acceptable, if not great. There were barista made espresso drinks on offer, a real delight, and plenty of other beverages to be had. Our flight boarded swiftly and took off on time. We flew on a 717 for the first time, which was fun. The service was prompt and attentive and we were offered a meal which turned out to be quite good. Upon arrival in Brisbane we collected our bags and headed to the Airtrain. We walked off the train into the city center twenty minutes later and headed to the Four Points by Sheraton. After a quick check-in we headed to our room for some much needed sleep before our busy next couple of days. We chose to stay in Brisbane for three nights and elected to allocate two full days to the Australia Zoo, home of the Crocodile Hunter. On our first day, we decided to do a koala encounter and, because of this, we had to get up super early to take the first train from Brisbane to Beerwah, where the zoo is located. After alighting from the train we started walking to the zoo given that the signage indicated the courtesy shuttle wouldn’t be running until much later in the morning and we’d miss our encounter time. After we walked 75% of the way, the courtesy shuttle pulled over to the side of the road in front of us and prompted us to jump on board. After a brief stop at the station we arrived at, we headed back to the zoo. Checking in with our pre-paid tickets was smooth and easy and we were quickly into the zoo proper. We wandered over to the information desk, past some crocodiles, and inquired as to where and how the encounter would be happening. We waited at the designated meeting spot, were shortly thereafter met by a photographer, and made our way to the koala meeting area. Once there, Baloo was brought out to us to start our encounter. There were two other people with us – a young American girl and a British woman. We would each get two chances to hold the koala. The first would be a short session to allow the zoo photographer to grab some official photos and the second would be a longer period of time to allow us to take personal photos and just enjoy the koala. Angela volunteered to hold the koala first and it was a great decision because she got to share a special moment with the koala. He liked her so much that he pooped on her! I held Baloo next, followed by the Briton and the young lady. Unfortunately, Baloo started acting up a bit and we had to do a koala swap. His daughter, Macadamia, came out and was a total sweetheart. We went in reverse order for the second session and everyone snapped some great pictures of themselves and the koala. The experience was exceptional and totally worth doing, in my opinion. Koalas, it turns out, are extremely solid. The small ones we were holding weighed around 15 pounds and were extremely warm. It was a dream of both of ours to hold a koala and it was even better than expected. After our encounter, we started exploring the rest of the zoo. There is a zoo shuttle that runs every half hour so we grabbed the next available one and took it to the back corner of the property to work our way forward. I would recommend anyone visiting the zoo to approach things this way. We started in Africa where we saw giraffes, zebras, rhinoceros, and meerkats. Next, we wandered through Bindi’s Island which was full of ring-tailed lemurs and a few big tortoises. The next stop on our tour was Southeast Asia where we watched the tigers snooze and were able to spot some red pandas up in the trees, but we weren’t able to get any pictures. After that, we bought some “roo food” and headed into the kangaroo and wallaby enclosure where we got to freely interact with the animals. They hopped right up to us and fed out of our hand. Angela and I both snapped kangaroo selfies and Angela, in particular, was amazed at how soft their fur was. It’s obvious that these animals are used to human interaction. They weren’t aggressive, but definitely knew how things should go down. It was extremely enjoyable. We left the kangaroo enclosure and headed to the echidna pen at just the right time because as soon as we were inside it started pouring rain. We checked out the echidnas for a few minutes and then patiently waited out the worst of the rain. On the way there, we took a couple of personal shots with an awesome lizard. We popped our umbrellas and headed for the wetlands area where we saw a few birds, including the surprisingly (and hilariously) vocal emus. We were getting hungry after this so we stopped at the Crikey Cafe where we ate some, surprisingly adequate, steak sandwiches. While we were eating we were treated to another torrential downpour – we were lucky enough to avoid both of them that happened on this day! After lunch we walked back to the Tiger Temple for the Tigers Live! show where the handlers showed off the tiger’s athletic ability during feeding time. On the way, we passed through the dingo and farm animal enclosures. It was pretty cool to see how tall the smallest tiger at the zoo was – a full eight feet when standing upright – and to watch him leap and climb for food. I also enjoyed seeing the bond between handler and tiger as they talked about how they had been with him since the day he was born. The comfort and respect shown between human and animal was really interesting to see. After the tiger demonstration we walked through the rainforest aviary, filled with colorful free-flight birds, before visiting the wombats, snakes, and birds of prey. Knowing we had another day of entry we decided to call it a day and head back to Brisbane. After a short courtesy bus ride and an hour long train journey we were back in the city and, soon, fast asleep in preparation for the next day. We had a more leisurely start to the second day at the zoo, waking up a little later and taking the second train to Beerwah instead of the first. As soon as we arrived we headed straight for the exhibits we hadn’t previously seen. This included the otters, Tasmanian devils, and another look at the echidnas. First, we stopped to admire the Irwin family statue. Shortly after we arrived we were treated to Otters Live! where the otters showed their intelligence, the handlers talked about their habits, and we learned the structure of an otter family. We also learned that Asian small-clawed otters are an indicator species, meaning that they act as an indicator of the ecological health of the region that they are occupying. After the otter demonstration we visited the casowary and binturong enclosures to take a peak at some unique animals. We later heard the casowary referred to as a prehistoric murder turkey, which strikes us as accurate. Angela also posed with a barking owl and its handler. We grabbed some ice cream and sauntered over to the Crocoseum to get ready for the big show at noon. The highlight show of the day was entertaining, if a little short. We were treated to some tropical birds, some birds of prey, dingoes, and an awesome crocodile feeding. It was all tied together with a video on the big screen by Steve Irwin, the Crocodile Hunter himself. Our final stop at the Australia Zoo was the Australia Zoo Wildlife Hospital. It only cost 2 AUD per person to enter and it was well worth it. We saw an orphaned baby kangaroo being bottle fed by a veterinary tech, witnessed some type of bird being operated on, and spoke with one of the helpful staff members at length about her experiences at the hospital. We walked to the on-site bus stop and caught the bus to Caboolture, boarded the train to Brisbane, and were back in the city after a short delay because of telemetry issues. We stopped at Burger Project for dinner and each ordered The Aussie. The burger itself was delicious. The patty was a little thin, though, and left us both wanting more. After a brief stop at our hotel we walked through the City Botanic Gardens before heading to Bean Cafe (delightfully situated down a random alley next to a loading dock) to finish the day with some delicious flat whites. Then, it was back to the hotel to rest up for the next part of our adventure. After two great days with an amazing array of wildlife, we were off to the Port Douglas area to experience a little bit of Northern Queensland and visit the intersection of two UNESCO Heritage sites. We left our hotel relatively early and arrived at the airport about half an hour later. After self-tagging and dropping our bags we went to the Qantas Business Lounge. There is a separate security checkpoint that was empty when we entered. The lounge itself was quite nice and was a great place to get some work done before our flight up to CNS. Of course, it wasn’t a great sign when every staff member who found out our destination was like “Ha – good luck with the weather!” Regardless, I worked for a while while Angela read and we eventually made the three minute walk to our gate. The flight took a little over two hours and we landed into a surprisingly sunny Cairns. We collected our bags and then, because our flight landed a bit early, we waited an hour for our scheduled shuttle to depart. We boarded the shuttle and, after an hour drive on windy roads through varying amounts of rain, we arrived at our hotel. We were upgraded to a studio suite with plenty of room and direct pool access. There was also a welcome amenity in our room with a full bottle of bubbles for Angela and a cheese and fruit plate for us to share. Of course, it didn’t look like we’d be doing much swimming because of Cyclone Trevor. The weather report for our stay in Port Douglas showed rain throughout its entirety, but we were determined to have a good time. We felt a bit peckish after checking in so visited the bar for some quick eats. We ordered a couple of cocktails (mine virgin, of course) and some BBQ pork buns. The drinks took forever to come out and the BBQ pork buns were adequate but nothing to write home about. When we settled our bill, the waitress, without us prompting in any way, removed the drinks from it because of the long wait. We headed back to the room and passed out in preparation for our action-packed week. On our first full day in Port Douglas we didn’t have anything specific planned so I took advantage of the time to get some work done. Other than working, we also headed into town to check out the local shops and restaurants. We took a twenty minute walk down Four Mile Beach to Port Douglas’s main street. We decided to grab some coffee at Origin Espresso alongside some doughnuts from Duke’s Doughnuts. The espresso was awesome and the doughnuts were great, especially the one that the barista gave us for free! We stopped at the grocery store to pick up some snacks for the upcoming week and then took the regularly running shuttle back to our resort. Angela took her bottle of bubbles and we headed to the main lobby area to relax and get some work done. Unfortunately, the rain never appreciably abated so there was no opportunity for outdoor activities beyond the beach walk. That being said, we were excited for the following day. We awoke bright and early, ate a filling breakfast, and prepared for our trip out to Australia’s most famous natural landmark. We booked our reef trip with Quicksilver Cruises, a well-reviewed activity outfit operating out of Port Douglas. We opted for coach pickup at our hotel and stepped on board at 9:30AM. After a five minute ride, we obtained our boarding passes from the company’s storefront and headed to the boat. Unfortunately, the sun did not come out and we were stuck with rain and wind for our journey out. Coffee, tea, and biscuits were served on board and Angela and I both grabbed a cup before heading upstairs. The ship started underway right on time and was immediately rocking back and forth by some modest swells. Neither Angela nor myself get sea-sick so the rocking wasn’t an issue for us but there were definitely people having some major difficulties on the journey out. Shortly after the journey started we attended our dive briefing for the introductory diving activity we chose. This was mostly a repeat of the dive training we’d received in Sydney prior to our shark diving experience with the exception that we’d be in the open ocean this time. The briefing took about half an hour and then we just waited for arrival at the reef platform that Quicksilver has anchored near Agincourt Reef. Upon arrival, we had about fifty minutes before our dive session. We moved on to the platform in pouring rain, changed into our Lycra bodysuits (for protection against jelly stingers), grabbed some flippers, and checked out the underwater observation platform for a few minutes while we anxiously awaited our dive. At our appointed time, we headed to the dive platform and got ready. Our instructor was Hiromi and she was awesome. She made us feel very comfortable as she verified our basic skills and throughout the dive. After checking that all four of the people in our group could breathe underwater, change their regulators, and clear their masks, we headed down to the reef. Our dive was scheduled to last for about half an hour and, during that time, we saw a wide array of aquatic life. We saw quite a few fish, a giant clam, a few brightly colored coral worms, and more. It was awesome swimming around under the ocean’s surface and it felt like we were experiencing life to its fullest. The reef was not as colorful as I expected on this dive, but the variety of life was definitely present. It was a real treat. As soon as we surfaced, Hiromi expressed surprise that it was Angela and my first open ocean dive. She said we were naturals and definitely didn’t act like beginners. Afterwards, she mentioned we could dive again after half an hour for an additional charge and we immediately agreed. We went into the cafeteria area, prepared a couple of plates of food for our journey back and asked the kitchen staff to set them to the side, then went back to the diving platform. On our second dive, it was just the instructor, Angela, and me and it was awesome. We explored a much wider area of the reef and saw a ton of bright and colorful wildlife, including a trumpet fish, a lion fish, and a huge grouper. Most excitingly, we saw a whitetip reef shark in the open water about twenty feet from us. Angela got so excited she made a heart symbol to our dive leader with her fingers. We also saw parts of a research project being run by Quicksilver Cruises in conjunction with scientists in the Queensland area that is attempting to stimulate reef production by application of an electric current to a metal mesh. Free swimming through the ocean was amazing. I wouldn’t trade the experience we had on this cruise for anything else in the world. After our second dive we changed out of our Lycra suits, grabbed our plates, and enjoyed the journey back to Port Douglas during which we talked about life and the world with one of the Quicksilver crew members, Scott. He was kind enough to draw us a map highlighting the best restaurants in Port Douglas on a seasickness bag. We hopped on the coach back to our hotel and relaxed the rest of the day after a tiring, but amazing, trip to the Great Barrier Reef. We had scheduled a recovery day after our Great Barrier Reef excursion and I’m glad we did because it was an extremely wet one. There were bursts of torrential downpours interspersed with milder rainfall. Essentially, though, we were trapped inside with nothing to do for most of the day. The rain disappeared long enough for us to make our way into Port Douglas for dinner at Watergate which was recommended to us by staff working at our resort. The quality of the food and creativity in the dishes were both outstanding. We started with crocodile karaage, enjoyed kangaroo loin and chicken supreme stuffed with crocodile and prawns as our main, and finished the meal with a dark chocolate brownie. We left satisfied and ready to face the next day. We awoke early on Saturday ready for our journey into the rainforest but, while we were at breakfast, we were informed that our tour had been canceled due to the paths being washed out by heavy rains. We were extremely disappointed but eagerly rebooked for the following day hoping things would clear up and we’d be able to go out. After two more hours of on-and-off rain, Angela and I decided to escape our hotel room and walk into town rather than pay the extortionate shuttle fee. The mile and a half walk was sweaty and hot but, thankfully, devoid of rainfall. Once in town we found a delightful little book shop, Whileaway, and ordered some drinks to sit in the air conditioning and escape the heat. We lingered for about an hour as the rain decided to restart as soon as we sat down. It was lunch time and we were hungry so we ambled over to Salsa, another recommendation by a Port Douglas local. Do not be confused by the name as this is not a Mexican spot. It offered a wide array of foods that seemed to have little in common. We ordered chicken spring rolls to start with beef filet and tiger prawn linguine as our mains. The spring rolls, in particular, were incredibly rich in their depth of flavor and seemed to be curry based, which neither of us had experienced before. I would recommend this restaurant to anyone looking for an interesting and delicious meal. Afterwards we stopped into the local grocery store to stock up on provisions before walking back to the resort in the sun. When we returned, we were lucky enough to get some time in the pool with a blue sky and enjoy the sun for another hour before the clouds rolled back in and it started to rain again. Overall, we made the best of a bad situation with our tour being canceled and crossed our fingers hoping things would be good to go the following day. Our crossed fingers worked because our tour was on for the next day! We were picked up promptly at 7:25AM, joining three others, and headed out to Mossman Gorge, the first stop on our itinerary. We took a small hike up into the rainforest around the gorge and witnessed the raging Mossman River, elevated because of high rains, and the heavy flow of Rex Creek, similarly elevated. Our guide showed us a few species of plants and we spotted an awesome looking lizard. Next, it was off to the Daintree River for a crocodile spotting cruise. We piled on to a small river boat with eight other people and set off down the murky river. There was ample evidence of storm and water damage from the three floods that have already occurred this year and the river was high on its banks due to the recent storms. It started raining about halfway into the cruise, but we managed to stay pretty dry. The best part of the river cruise was spotting two crocodiles. The first was a juvenile about four feet in length. The second was a named mature female, Lizzy, about six feet in length. It was awesome seeing these apex predators in the wild. We got about twenty feet away from Lizzy at one point – close enough to admire her in detail. We were dropped off at the ferry pier, rejoining our tour guide. From there, we stopped at a beach for a bit of tea and coffee before continuing on to a longer trek through the rainforest to admire some of the native flora and fauna. On the way from the beach to our trek, we got to witness a bit of Daintree humor. The rainforest trek was awesome and full of incredible vistas. I’ll let the pictures do the talking. We stopped at Cape Tribulation after our rainforest trek and admired the beauty of David Attenborough’s favorite place. After leaving Cape Tribulation it was a slow drive back to Port Douglas as the rain started up and we encountered a mudslide over the only road at one point. We stopped at one final lookout spot before heading back into town. Overall, the Daintree Rainforest tour by Tony’s Tropical Tours was a delightful controlled trek through some some truly amazing scenery. The moments of sunshine highlighted the beauty even further, but I will say that the rain wasn’t all bad. It led to some truly amazing river vistas as they roared through the forest. Our final stop on our Australian journey was Melbourne. We packed up our things, ate some breakfast, and hopped on our coach back to the Cairns airport. Again, we relaxed at the QF business lounge for a few hours before boarding our plane for the three hour hop down to Victoria. The flight went by quickly, although by the time we got to Melbourne and suffered through a time change, it was already 6:30PM. I addressed an issue that had come up with work and then we headed out for dinner. We wanted to go casual on our first night and chose Metro Burgers. After burgers we decided to grab some doughnuts for dessert and wandered over to Walker’s Doughnuts. Angela chose a glazed jam-filled doughnut and I opted for a French toast ring. Both were exceptionally well-cooked and flavored. I highly recommend Walker’s for anyone looking for a treat. After that, it was back to our room to relax and prepare for the day of tourism we had ahead of us. After a delicious breakfast at our hotel, we set off into Melbourne to experience the hum of the city. Our agenda for the day was simple and consisted of walking through a bunch of parks, doing some light shopping for some individuals we were meeting, and visiting the State Library of Victoria. We accomplished all that and more. We couldn’t get started until we had some coffee, though, so we made our first stop at Dukes Coffee Roasters for some flat whites. The place was packed and, we found out, for good reason. The drinks we had were delicious. Afterwards, it was off to Fitzroy gardens for a brief stroll and some picture taking. The amount of green in Melbourne is awesome and, by this point, we were already excitedly talking about it being a place we’d love to live. We saw several groups exercising and meditating in the park, including a promotion being filmed for Active April, a government-run campaign prompting people to get up and move around. Our next stop was the Carlton Gardens but, unfortunately, much of the space was blocked off due to the forthcoming Melbourne International Flower and Garden Show. We still experienced about half the park and got to see the facade of the Royal Exhibition Building, an impressive structure in its own right. Next up was the State Library of Victoria, a modern civil engineering marvel. The big draw is the reading room’s dome, but there is a variety of exhibitions inside of the library itself that are worth seeing. From there, it was time for a walk across town to a boutique pet shop to get some treats for Fitz, Noodle, and Frankie. The latter two are Australian dachshunds who we met via Instagram and arranged meetings with in Melbourne. 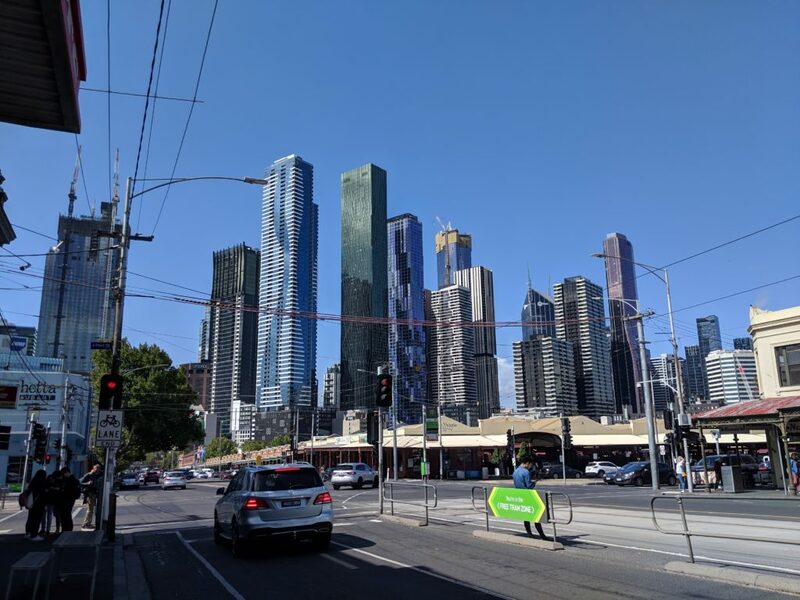 The walk through the city was quite enjoyable and led me to believe that Melbourne is, basically, a cleaner San Francisco. The city views on our stroll were great. We stopped for a brief respite back at our hotel before continuing across the Yarra River to the South Bank where we walked through three more gardens before arriving at the Shrine of Remembrance, a memorial built to honor those who served in The Great War and later extended to include a courtyard and other structures honoring World War II veterans and those from other conflicts. We were not expecting this, but there is a huge museum dedicated to Australian war efforts throughout their history underneath the memorial itself. We ended up spending a majority of the afternoon there, only leaving five minutes before close. We strolled back to the hotel, got dressed, and headed to dinner at Bistrot d’Orsay. The restaurant was located, literally, across the street from where we were staying and had amazing reviews on every site that I looked. Unfortunately, we walked away a bit underwhelmed. The food was good, but the meal wasn’t special in any meaningful way and Angela left feeling slightly unsatisfied. Not to worry, of course, as we were able to easily wrangle up a drink and small meal in the Lobby Lounge at our hotel. The chicken wings we ordered were delicious and Angela’s Westin Mule was, reportedly, a great way to finish off the day. On our last full day in Australia we decided to avail ourselves of the local cafe culture and opted for a guided tour by a local. We met a few blocks from our hotel and sampled a variety of local coffee spots, a patisserie, a chocolatier, and ended at a hip cafe for lunch. Along the way, we were given a brief glimpse into the history of Melbourne and, specifically, the coffee and restaurant scene. We were on the tour with one other American and an older Australian couple. Robert, the retired Australian electrician, and I really hit it off. So much that, apparently, our guide joked about giving us our time to ourselves at one point. I loved talking to the Australian couple and understanding their perspective on the world and on life. After our tour concluded, we were off to Chokolait so that Angela could get a Pavlova before we left Australia. It is one of the country’s most famous dishes and, from all reports, this particular shop makes a delicious one. Angela took a bite, stored the rest, and then we jumped on the tram for a very important date with Noodle and Alison at Journeyman Cafe. We had a wide-ranging chat with Alison, gave Noodle some gentle pats while admiring his handsomeness, and enjoyed another great cup of coffee. We said our goodbyes when the cafe closed and walked to the St. Kilda Pier to see the sunset and wait to see our first penguins in the wild. Our stroll included some interesting sites and we were lucky enough to see some of the little penguins after the sun went down. On our last day in Australia, I must admit that we slept in. We’d done so much over the previous two weeks that we decided to rest a bit before a long day and a half including an 18 hour time change. After we awoke, though, we were out in the streets and eating and drinking everything in sight. We stopped at three separate cafes for espresso: Sensory Lab, Pelligrini’s, and Brother Baba Budan. Sensory Lab’s espresso was bitter and Angela didn’t bother drinking hers but both Pelligrini’s and Brother Baba Budan were delicious! In fact, Brother Baba Budan had such good coffee that I bought beans to bring back to the United States for my favorite local barista. We finished with another stop at Dukes Coffee Roasters. We didn’t just drink coffee, though! We also stopped at Koko Black for some chocolate truffles, a cupcake from Little Cupcakes, and a crossaint from the aforementioned Dukes Coffee Roasters. After packing up, we checked out and were off to meet with another Melbourne dachshund, Frankie! We had a delightful afternoon with Frankie and her pawrents with a wide-ranging conversation over the course of more than two hours. It was an amazing way to end our time in Australia. We took the tram halfway back to our hotel before it stopped unexpectedly due to a tram accident on the rails ahead. It was a walk of about a mile from there where we picked up our bags and headed to the airport. Check-in was extremely pleasant with the agent asking us if we wanted to sit together and then saying “Oh – you’re actually in the best seats on the Dreamliner so I’ll just leave you there.” We visited the Qantas Business lounge after picking up some Tim Tams at the airport shop, ate some decent food, and waited patiently for our flight. We boarded about forty minutes before departure and, before long, we were off to the USA. The seats on QF’s Dreamliner are quite comfortable, if a little firm, and I had enough storage space for my phone, laptop, and Nintendo Switch. Pajamas were provided, a rarity for business class in my experience. The flight attendants provided friendly service throughout the flight and the meal served shortly after takeoff was delicious. Angela and I both opted for the barramundi with polenta and I’m happy I did. After dinner, Angela and I chose to snooze and we were both awake with about four hours remaining in the flight. We entertained ourselves until the light dinner served about ninety minutes before landing and, before we knew it, we were back in the United States. Once we landed, we decided we’d rather go home than overnight in San Francisco so I booked a Southwest flight using Rapid Rewards points and our companion pass. After a short car ride, we were home and unpacking. We learned a lot during this trip, the most important being that we loved all of the places we visited in Australia, Melbourne in particular. Each major city was beautiful in its own right and diving on the Great Barrier Reef is an experience that we’ll never forget. We can’t wait to go back in the future and explore more of the country, including Tasmania and Western Australia, and will almost certainly return to the Cairns / Port Douglas area at some point, as well. If we could go back in time and revise our trip there are only a few changes we’d likely make. First, we might start in Northern Queensland and then work our way down the coastline. In addition, we would try to visit when there isn’t an active cyclone drenching Port Douglas in rain. Finally, I would choose to stay somewhere somewhere a little nicer when in Brisbane so that we would have water pressure during our showers. Other than that, I was happy with our schedule and activities and look forward to a future return to the country.